Ed Darrell has criticized ClimateSanity for not addressing the flooding in Manhattan from Hurricane Sandy. So I will say a few words for Ed‘s benefit. Ed is worked up by one of my previous posts, Manhattan Underwater, (part of my “Cities Underwater” series), which was critical of the picture on the cover of Heidi Cullen’s book “Weather of the Future.” The picture showed Manhattan sometime in the future with the entire region between Lower Manhattan and Midtown Manhattan completely submerged. I showed a map of water depths for various hurricane storm surges in Manhattan. As it turns out, that map was proven to be accurate by Sandy. Here is the map I showed. By all accounts, the red region and part of the orange region on this map is the area that flooded during Sandy. Consider “The Great Gale of 1821,” which hit New York City on September 3rd of that year. It’s storm surge was reported between 11.2 and 13 feet. But, as reported in the September 4th, 1821 edition of the Evening Post, the tide was “at low water when the gale commenced.” This contrasts with Hurricane Sandy, which unluckily hit the area when the tide was at its highest. The tidal range at the Battery (southern tip of Manhattan) is about 5 feet. If the Great Gale of 1821 had made landfall 6 hours before or after it did, then the surge would have been as much a five feet greater than Sandy’s. It was just a matter of the luck of timing. My father, who grew up in the Boston area reminded me of the “Great New England Hurricane of 1938“. Blue Hill Observatory (“Home to the oldest continuous weather record in North America), about 10 miles south of Boston, reported winds up to 186 miles per hour. Tide surges between New London and Cape Cod randged from 18 to 25 feet. Downtown Providence, Rhode Island went 20 feet underwater in the storm surge. The Connecticut River in Harford went 19 feet above flood stage. There are 25 or 30 major US cities along the Gulf Coast and the East Coast: Brownsville, Corpus Christi, Houston, Baton Rouge, New Orleans, Biloxi, Mobile, Pensacola, Tampa, Fort Myers, Miami, Fort Lauderdale, Orlando, Jacksonville, Savannah, Charleston, Myrtle Beach, Wilmington, Norfolk, Washington DC, Dover, New York, Boston, etc. Every few years one of these cities is going to be hit by a Hurricane. The following two plots demonstrate the truth of this point. 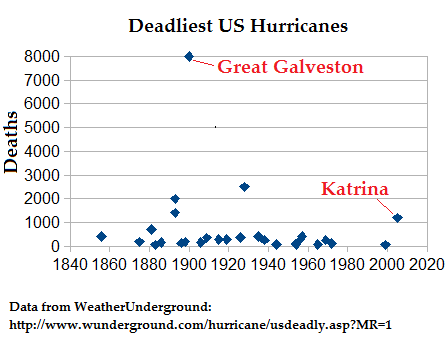 The data are from the WeatherUnderground and shows the 30 deadliest hurricanes (measured in number of deaths) to make US landfall in the last 150 years. 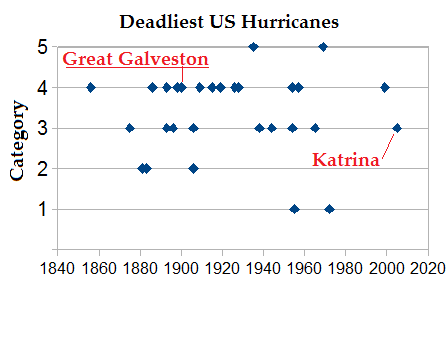 One thing I notice when I look at these two above graphs is the paucity of deadly hurricanes over the last 30 years or so. The occurence of an unusual random event does not make the probability of that event happening again any greater or lesser. 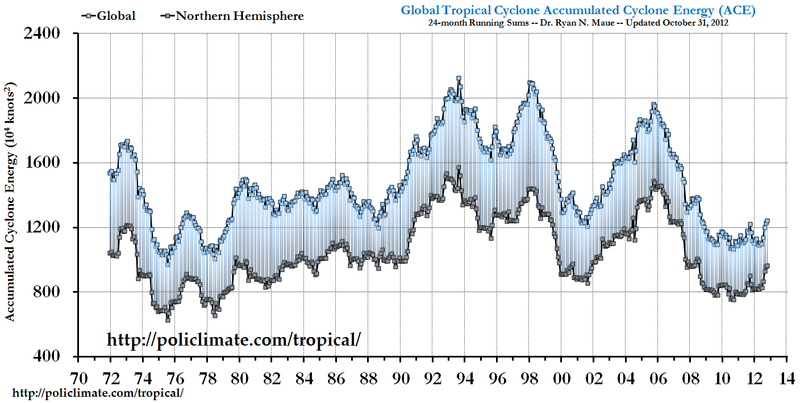 Consider also the Accumulated Cyclone Energy, which was always high on the list of alarmist talking points until a few years ago. They don’t seem to mention it much anymore for some reason. 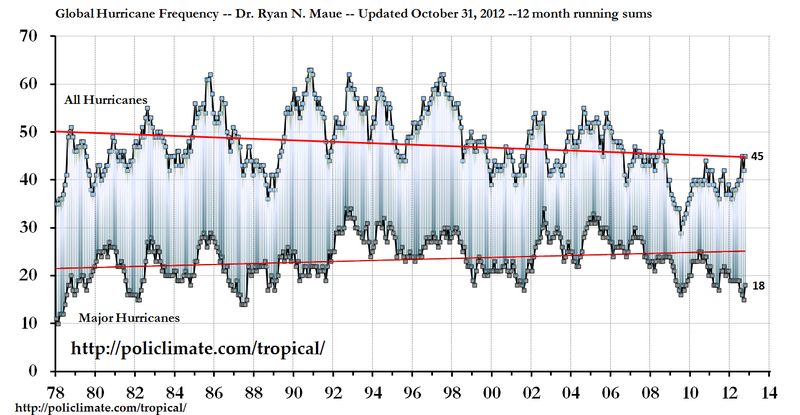 What Is Making Frankenstorm Sandy Exceptional? 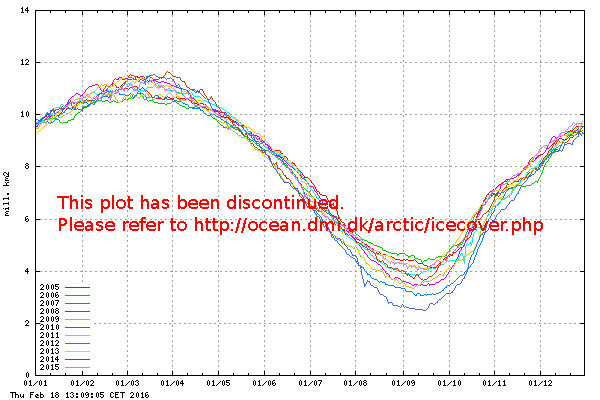 Have you seen Rahmstorf’s videos at RealClimate? No, I haven’t. 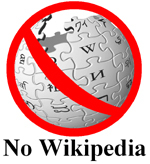 This is the first I have heard of them.